Posted for Marylyle McCue, Digital Library Intern, 2010. Detail from A.M. Thackara’s Letterhead. The Sherman Thackara Collection is comprised of private letters, photographs and other documents belonging to General William Tecumseh Sherman and his family. Three entire boxes contain the love letters of Eleanor Mary Sherman Thackara, one of the four daughters of General Sherman and his wife Ellen Ewing Sherman. Eleanor (aka Ellie) and Alexander Montgomery Thackara (aka A.M. or Mont) kept up a passionate correspondence for many years both before and after they were wed on May 5th, 1880. The letters range in date from 1879-1897. Mrs. Thackara is believed to have donated these letters to Villanova some time around 1897. Recently I had the pleasure of transcribing several of Mont’s letters to Ellie, as well as to read many of the letters written by Ellie to Mont. One consideration when reading someone else’s letters is that over time you come to recognize the author’s idiosyncrasies and the letters become much easier to read, as if they were written in the hand of an old friend. Certain letters may be a struggle to read until one has become more familiar with the process and with the author’s handwriting, while others may just be a lost cause. Reading letters in a digital format presents different advantages and disadvantages in comparison to reading them in person. In person, one can hold the work in their hands (or gloves) and look closely, perhaps even using a magnifying device. Of course, the archives may not be within a close distance, they may not be open during convenient hours, require an appointment or have room for only a few researchers on any given day. Though one cannot physically examine a digital document, image correction can be used to make it more readable. Contrast, brightness and sharpness can be adjusted to make an image more legible than it would be in person. They can also be printed and written on when otherwise, at best, they would need to be photocopied by a librarian or at worst the researcher would have to make painstaking notes. Barring an Internet outage or major site upgrade, digital library images are available to you in your home or office 24 hours a day. As a countermeasure, when there was a delay in the project due to a site upgrade for the Villanova Digital Library, I saved a stockpile of digital letters as PDF images to my computer to prevent any further delays. It is certainly not an exaggeration to say that digital collections have forever changed the face of historic research. 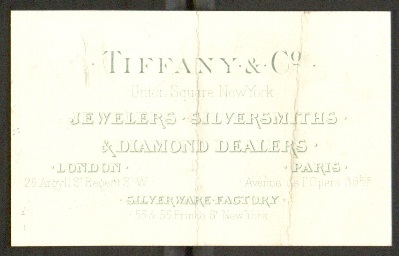 Business card from Tiffany’s with Miss Sherman’s (possibly Ellie’s) ring size written on back. One popular misconception about the Victorians is that their personal lives were devoid of romance or passion. On the contrary, during this period the notion of marrying for love became common and accepted in middle and upper class society. The Victorians were simply very private about their personal lives and extremely careful of when, where or in front of whom this side of them was displayed. A person would share their most personal feelings, fears and desires only with their beloved. However, it was understood that physical consummation of this passion would only be acceptable within the boundaries of marriage. The written word was then the most common and effective way to express these powerful emotions. There are countless examples of the devotion and sheer adoration that this couple felt for one another throughout their letters. Only a few examples can be shared in this post, but they offer a glimpse of the letters’ contents along with a few recurring themes common in love letters of the time. In one note, Mont wonders to his sweetheart if she can imagine anything “more heavenly than pure love” and how those who have never felt it cannot truly conceive of it. “My Little Darling- Oh! You know so well that every day my love for you is growing stronger. Every day you become more dear.” A detail from one of Mont’s letters to Ellie. Another example shows Mont simply wondering what important and mysterious matter Ellie plans to discuss with him that evening that she would not write to him in a letter. He ponders, “I am prepared for a serious talk my Darling on what subject I cannot fancy, still I will soon find out.” It is also likely that there could have even been some letters deemed too personal for donation. Another notable convention present in love letters of the period is “testing,” where one lover ensures the devotion of the other through self-deprecation, admitting to or attempting to provoke jealousy. The author seeks a response assuring them of the other’s love and faithfulness, as well as of their own good qualities. Mont and Ellie often tease one another about trying the other’s patience, while also offering reassurance to the other. Each also claims to fear that they are completely unworthy of the other, as well as revealing a hope that the relationship will improve their own individual characters. Ellie refers to herself as “a good for nothing little body” and looks to Mont to dispel her fears that another lady will catch his fancy. Mont attempts to ease them in one note where he has “not seen any of the young ladies of this place yet, nor have I any desire to see them. All I want is to see you again.” Mont himself reveals, however, a terror that when their wedding day arrives, though he finds that he loves Ellie more than before, she will discover that she does not love him at all. A man of this time period and society would likely have had few, if any, outlets for expressing insecurities other than to his beloved. The Victorian masculine ideal was strength tempered by gentlemanly restraint while the feminine ideal called for “piety, purity, submission and domesticity” [Welter, pp. 151–174]. Evidence of period gender roles and expectations are apparent throughout both Mont and Ellie’s letters. Mont repeatedly describes Ellie as “pure” and lauds her for her piety. He also refers to “how happy I will be to know that a darling little soul will look up to me for […] protection and how proud I will be to protect her from any harm.” Ellie in turn writes of, “how happy I shall be in waiting upon you caring for you, learning better + better to anticipate your wishes and to please you.” Each vows to take care of the other, albeit in gender appropriate ways. Mont wants to shelter his “timid little one” from the wider world, while Ellie wants to nurture her “spoiled boy Mont” inside the confines of their household. Welter, Barbara. “The Cult of True Womanhood: 1820–1860.” American Quarterly, 18.2 (1966): 151–174. Fascinating! That must have been a really interesting transcription project. Yes very fascinating indeed. Thanks for your time in creation!